A specialist in optics and optical recognition in robotics, Ellen Ochoa is noted both for her distinguished work in inventions and patents and for her role in American space exploration. Among Ellen Ochoa's optical systems innovations are a device that detects flaws and image recognition apparatus. In the late 1980s she began working with the National Aeronautics and Space Administration (NASA) as an optical specialist. After leading a project team, Ochoa was selected for NASA's space flight program. She made her first flight on the space shuttle Discovery in April 1993, becoming the first Hispanic woman astronaut. The third of five children of Rosanne (Deardorff) and Joseph Ochoa, she was born May 10, 1958, in Los Angeles, California. She grew up in La Mesa, California; her father was a manager of a retail store and her mother a homemaker. Ochoa attended Grossmont High School in La Mesa and then studied physics at San Diego State University. She completed her bachelor's degree in 1980 and was named valedictorian of her graduating class; she then moved to the department of electrical engineering at Stanford University. She received her master's degree in 1981 and her doctorate in 1985, working with Joseph W. Goodman and Lambertus Hesselink . The topic of her dissertation was real-time intensity inversion using four-wave mixing in photorefractive crystals. While completing her doctoral research she developed and patented a real-time optical inspection technique for defect detection. In an interview with Marianne Fedunkiw, Ochoa said that she considers this her most important scientific achievement so far. In 1985 she joined Sandia National Laboratories in Livermore, California, where she became a member of the technical staff in the Imaging Technology Division. Her research centered on developing optical filters for noise removal and optical methods for distortion-invariant object recognition. She was coauthor of two more patents based on her work at Sandia, one for an optical system for nonlinear median filtering of images and another for a distortion-invariant optical pattern recognition system. It was during her graduate studies that Ochoa began considering a career as an astronaut. She told Fedunkiw that friends were applying who encouraged her to join them; ironically, she was the only one from her group of friends to make it into space. Her career at NASA began in 1988 as a group leader in the Photonic Processing group of the Intelligent Systems Technology Branch, located at the NASA Ames Research Center in Moffett Field, California. She worked as the technical lead for a group of eight people researching optical-image and data-processing techniques for space-based robotics. Six months later she moved on to become chief of the Intelligent Systems Technology Branch. Then in January 1990 she was chosen for the astronaut class, becoming an astronaut in July of 1991. Her first flight began April 8, 1993, on the orbiter Discovery. She was mission specialist on the STS-56 Atmospheric Research flight, which was carrying the Atmospheric Laboratory for Applications and Science, known as Atlas-2. She was responsible for their primary payload, the Spartan 201 Satellite, and she operated the robotic arm to deploy and retrieve it. This satellite made forty-eight hours of independent solar observations to measure solar output and determine how the solar wind is produced. Ochoa was the lone female member of the five-person team which made 148 orbits of the earth. Ochoa's technical assignments have also included flight-software verification in the Shuttle Avionics Integration Laboratory (SAIL), where she was crew representative for robotics development, testing and training, as well as crew representative for flight-software and computer-hardware development. Ochoa was on the STS-66 Atmospheric Laboratory for Applications and Science-3 (ATLAS-3) flight in November 1994. ATLAS-3 continues the Spacelab flight series to study the Sun's energy during an eleven-year solar cycle; the primary purpose of this is to learn how changes in the irradiance of the Sun affect the Earth's environment and climate. On this mission Ochoa was Payload Commander. She is currently based at the Lyndon B. Johnson Space Center in Houston, Texas. Ochoa is a member of the Optical Society of America and the American Institute of Aeronautics and Astronautics. She has received a number of awards from NASA including the NASA Group Achievement Award for Photonics Technology in 1991 and the NASA Space Flight Medal in 1993. In 1994, she received the Women in Science and Engineering (WISE) Engineering Achievement Award. She has also been recognized many times by the Hispanic community. Ochoa was the 1990 recipient of the National Hispanic Quincentennial Commission Pride Award. She was also given Hispanic magazine's 1991 Hispanic Achievement Science Award, and in 1993 she won the Congressional Hispanic Caucus Medallion of Excellence Role Model Award. Ochoa is also a member of the Optical Society of America, the American Institute of Aeronautics ands Astronautics, and Phi Beta Kappa and Sigma Xi honor societies. Ochoa is married to Coe Fulmer Miles, a computer research engineer. They have no children. Outside of her space research, Ochoa counts music and sports as hobbies. She is an accomplished classical flautist—in 1983 she was the Student Soloist Award Winner in the Stanford Symphony Orchestra. She also has her private pilot's license and in training for space missions flies "back seat" in T-38 aircraft. 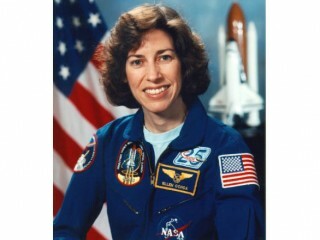 View the full website biography of Ellen Ochoa.